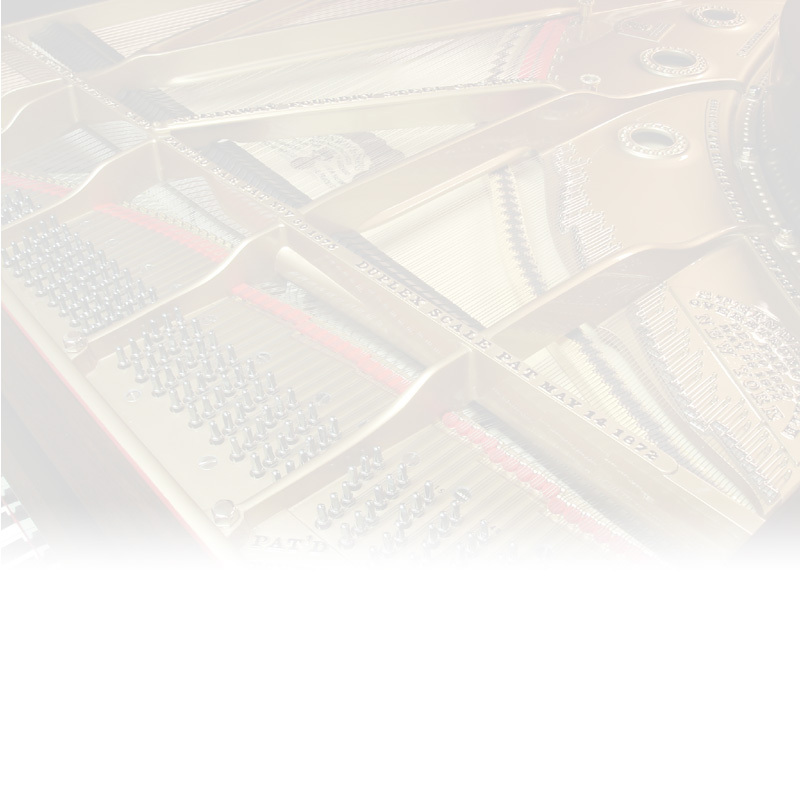 Any grand piano, and subsequently its restoration, can be broken down into three major areas of construction: the case, the belly, and the action. The rim is the curving fortress into which most of the pianos components fit. The rim consists of the outer shell, the heavy beams beneath, and the keybed on which the keyboard rests. Above the rim rest the toplid and music desk; below, the legs and pedal lyre. In addition to providing a massive, rigid superstructure, the case and its related furniture parts constitute the cosmetic beauty of an instrument. Though the rim is bent of rather drab looking hard rock maple, it is skinned with beautiful veneer (mahogany, for instance) which receives either a transparent natural finish or opaque black lacquer, a process referred to as ebonization. The belly is the vibrating system of the piano. It consists of the spruce soundboard and maple bridges, plate (massive gold-colored cast iron frame), strings, tuning pins and pinblock. With the exception of the pinblock, all these components are visible when the lid is raised. The concealed pinblock lies beneath the plate at the front end of the piano, into which some 230 tuning pins are anchored. The belly maintains a critical, delicate balance between strength and power and flexibility and freedom. The plate, rim and pinblock manage the twenty tons of string tension, while the bridges and soundboard transform the energy imparted to the strings via the pianos hammers into what we appreciate as beautiful music. The action mechanism is a fascinating Rube Goldberg affair. A rocking lever (the key) lifts a series of levers (collectively, a whippen), which propels a felt-covered hammer (pivoted on a hammer shank) towards the intended strings above. There are 88 such mechanisms side-by-side in a piano action. In addition, the key also lifts a felted damper head (via a damper underlever) off its related strings so the note may sustain at the pianists will. Further, the pedal assembly (the lyre) houses three controls: the left pedal for soft play (the una corda), the center pedal for selective sustain (sostenuto), and the right pedal for global sustain. The trapwork, situated on the underside of the keybed, connects the motion of the three pedals to the action mechanism above. If a restored instrument is to perform as it did the day it left the factory, or better, each of these elements, along with all its numerous subassemblies and subtleties, needs to be fully addressed in the rebuilding environment. Please continue on to Restorations for an outline of how each of these restoration phases is performed in my shop.